To provide the best tree care and removal services to our clients through professionalism and adherence to best industry practices in tree care. Scroll down to see the services we provide. Trees are beautiful assets to our property. When the difficult decision is made to remove one, don't chance the removal to any company. We provide licensed, insured, and professional tree removal services to all of West Michigan. Whether the tree is small and in the open, or large and overhanging building, we can safely and efficiently remove it without damaging your home or property. Give us a call or fill out the form on the contact page for a free estimate. Trees do their best to increase their foliage to survive. Sometimes those limbs are in a position to damage buildings or compromise the structure of the tree itself. Proper pruning will increase the shape and structure of the tree increasing its beauty and health. Don't risk your tree to just any company. Improper pruning can cause damage to the structure of the tree and invite disease and insect infestation. We prune trees to the current ANSI industry standards. Give us a call or fill out the form on the contact page for a free estimate. Trees are incredibly strong with roots that run deep into the earth. Although when Mother Nature does her worst, even the best rooted tree can succumb to her wrath. Damaged and downed trees pose special hazards and concerns not associated with standard removals. We work with insurance companies to remove the damaged trees from your property safely so you can begin to repair the damage caused by the storm. Storm damage services are provided 24 hours a day. Give us a call or fill out the form on the contact page for a free estimate. 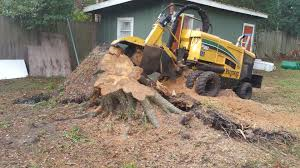 Whether you are clearing trees for a new pole barn, a lot for a new home, or several lots for a subdivision, we can efficiently remove the trees on schedule so you can complete your project. 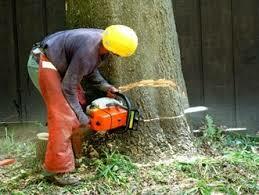 We also buy timber and provide a credit on your bill for any marketable logs removed. Don't make the mistake of calling a company who doesn't provide timber credit, your trees may have more value than you think. Give us a call or fill out the form on the contact page for a free estimate. Got stumps? We've got you covered. Whether you have one or one hundred, we can quickly transform those stumps into piles of mulch. Our machine will fit where others won't. A 36" gate? No problem. Our machine fits through a standard fence gate and grinds to a depth of almost 2 feet to take care of even the biggest stumps. Give us a call or fill out the form on the contact page for a free estimate.